Ann and I want to thank everyone who sent cards or flowers, emailed us, or commented on our birth announcement post. And we agree with you: Jack is pretty damn cute. We brought Jack home on Wednesday. Most of the time, Jack has been a good little nurser. 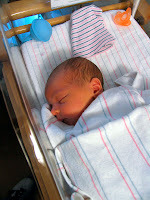 We've so far be able to keep him off formula – something we weren't sure we'd be able to do given his size. But Ann has been able to keep the lil' guy well fed. 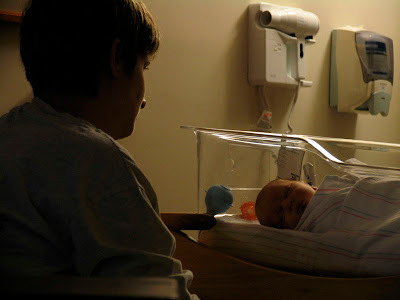 Aside from a little sleep deprivation, Ann is doing great, both for herself and for the kid. She has taken to being a mom very well and very quickly. 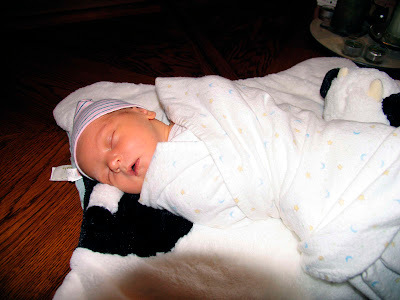 And while she remains swaddling-challenged (JD is the reigning household authority), those of us in the immediate family have been very impressed with her. The kiddo passed all his medical screens. 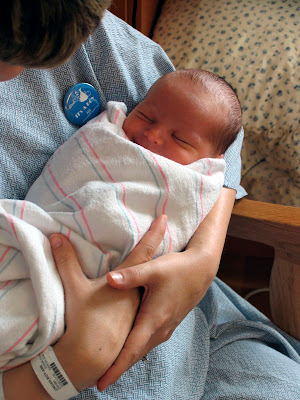 When we took Jack in for his first pediatric visit the nurses and doctors were blown away by the size of his giant feet – they were almost too big for the footprint cards at the Northside NICU! He's only lost half a pound since birth and, if his healthy appetite has anything to do with it, he'll be back to his birth weight before his next weigh-in at PAL. Sparky has taken to Jack better than we'd hoped. Jack Russells have a reputation for not getting along with kids but Sparky's initial curiosity has fast been replaced by an adorable protectiveness. When Jack cries, Sparky usually beats Ann or me to Jack's side. 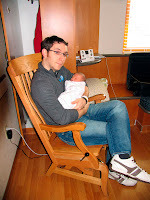 In response to an overwhelming number of requests for more pictures, please find photos above and below of Jack in the hospital and after we brought him home (as before, click on the images for a larger view). And look for a video update in the next week – in addition to letting me write baby names on her pregnant belly, Ann agreed to participate in a time-lapse sequence showcasing her swelling stomach over the course of 9 months. As ever, we'll post any JD-, Ann-, or Jack-related updates here, so check back often! We love that Jack inherited the signature Jordan sh*tty grin. 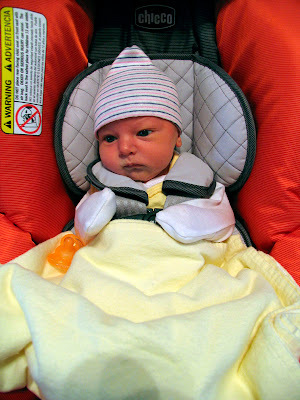 Jack strapped into his Chicco car seat, ready to roll.